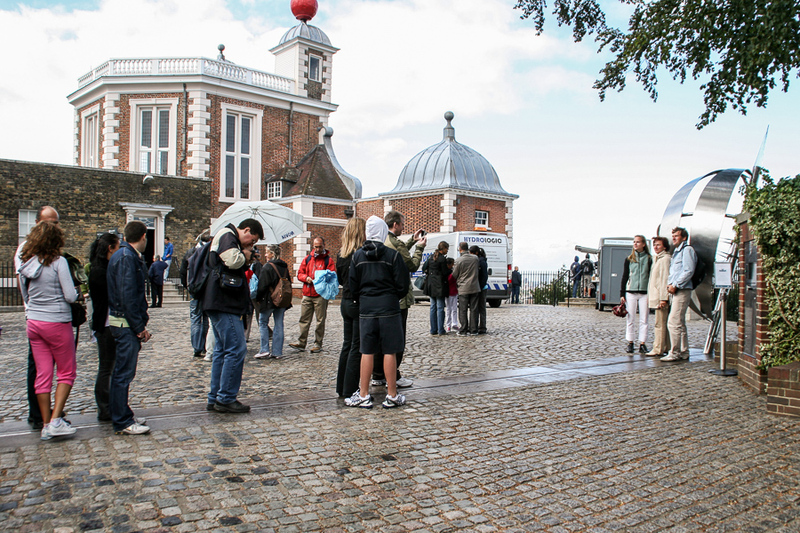 Every year, hundreds of thousands of tourists from all over the world descend on the Royal Observatory in Greenwich to pose for a photograph astride the Prime Meridian, the famous line which divides the eastern and western hemispheres of the earth. There is just one problem: according to modern GPS systems, the line actually lies more than 100 metres to the east, cutting across a nondescript footpath in Greenwich Park near a litter bin. Now scientists have explained why – and it all comes down to advances in technology. According to a newly published paper on the discrepancy, which has existed for many years, tourists who visit the observatory at Greenwich often discover that they “must walk east approximately 102 meters before their satellite navigation receivers indicate zero longitude”. If you look at that photo's metadata, you can see the GPS location that I added using the mapping feature of Adobe Lightroom. According to Google Maps, the monument is actually at 0°0'5"W.
The article uses the term "wrong" when in actuality Greenwich Mean Time (GMT) is still based on the Prime Meridian, though with the network of atomic clocks it isn't used much anymore, however the marker itself is very much in the right place. It is just when you use the coordinates on a GPS you end up at a different location. 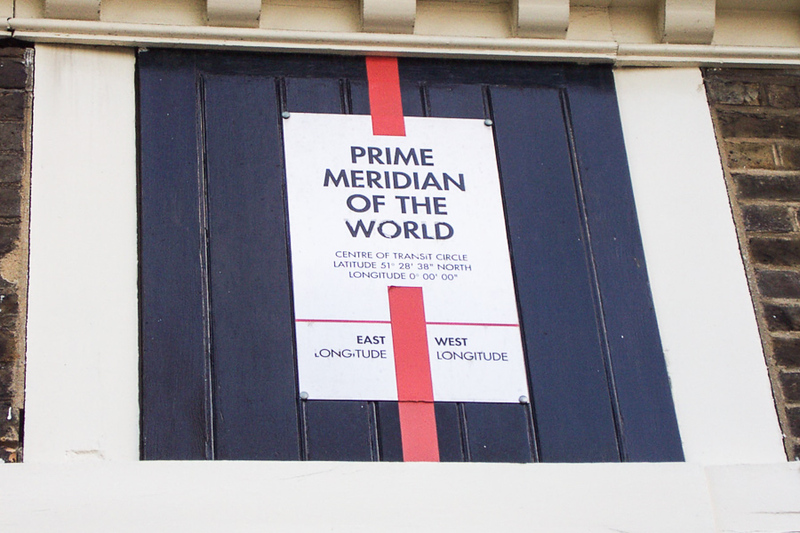 This is because GPS doesn't use the Prime Meridian as a starting point. GPS uses multiple locations all across the globe as anchor points in which to triangulate a location from called the geodetic system. The system does not rely on fixed straight lines as we see on a map but rather contours to the physical and gravitational shape of the Earth. So in essence just as the gig line (navy term) of my shirt doesn't lie straight and flat across by oversized 50 year old belly neither does the imaginary geodetic lines. These imaginary lines if drawn on a map would deviate east and west and would appear wavy. In the end, it is not about being wrong (as the article implies) but rather why do the two systems not match up. And this is science, too. As the Royal Observatory's public astronomer Dr Marek Kukula told the Independent, “We’re forever telling this story, making the point that as we refine our measurements and get better technology of course these things change, because we want to have the best possible data." On the other hand, climate change is making Chicago a little more pleasant, even without the record El Niño forming in the Pacific right now. Crime is down, green space is up, and the lake is clean. It's really a great time to live here. We are going to have to pay those pensions, though. To the anger of many travellers, some airport concessions have been reclaiming taxes on purchases for consumption outside the European Union (EU) rather than passing the saving onto the shopper. The wheeze is simple. When you line up with your sandwich, suncream and bottled water, checkout operators ask to scan your boarding pass. If it is for travel within the EU then the VAT, or sales tax, goes to the government. If it is for travel outside the EU then it should be tax free, but the shop charges you the same price and pockets the difference—20% of the retail price. The practice is legal but many think it downright dishonest. Travellers who ask why they need to produce boarding passes for items as innocuous as chewing gum are often told that it is for "airport security". Unsurprisingly, never, in Gulliver’s experience, have they said that it is actually so they can pocket the tax differential. The practice has prompted a backlash. David Gauke, a treasury minister, said the tax-relief measures were designed to be passed onto the consumer, not pocketed by the retailer. I usually don't buy much in the cavernous post-security shopping mall, but the next time I do—potentially three weeks from Sunday—I'm going to be more vigilant. "I wonder whether people understood the math"
A dense, 78-page bill aimed in part at curbing pension abuses in downstate and suburban school systems landed in lawmakers' laps two days before their scheduled May adjournment [in 2005]. One sponsor called it the first “meaningful” reform in 40 years, a reversal of “decades of neglect and bad decisions.” Another predicted that it could save the state up to $35 billion. Crain's has a definite point of view, and while I'm not sure I completely agree with it, they show how the bad decisions weren't confined to any party or clique. Illinois politicians of both parties showed crashing (or willful) ignorance of basic financial math for so long that it's impossible to hold any of them truly accountable. Maybe that was the plan all along. Illinois isn't going to drop off the map, nor is Chicago going to disappear like other major industrial cities east of us have done. But we're certainly heading towards ugly negotiations with state retirees and with taxpayers. I just hope that as taxes increase to pay for our past sins, the benefits of living in a vibrant and connected urban space outweigh the increasing costs. Something has to give, and soon. Maybe our pensions crisis will push us into electing more responsible officials. I'm not optimistic in the short run. It’s not everyday that a nation chooses a new flag by its own volition, with the support of the voters, without any drastic regime changes. New Zealand is doing exactly that. 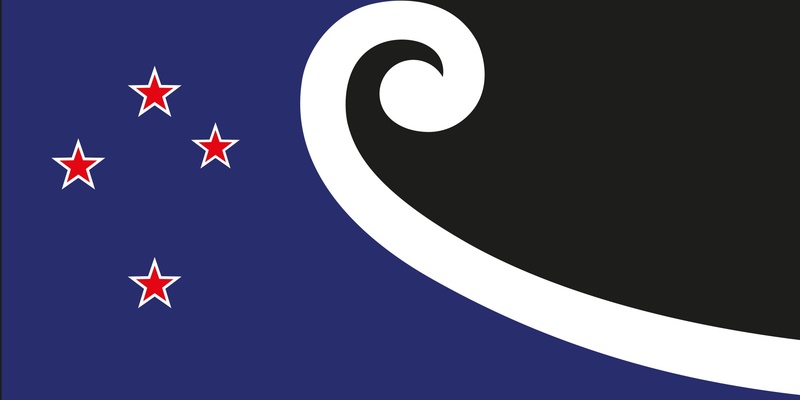 With the Flag Consideration Project, the Kiwis are trying on a new look. 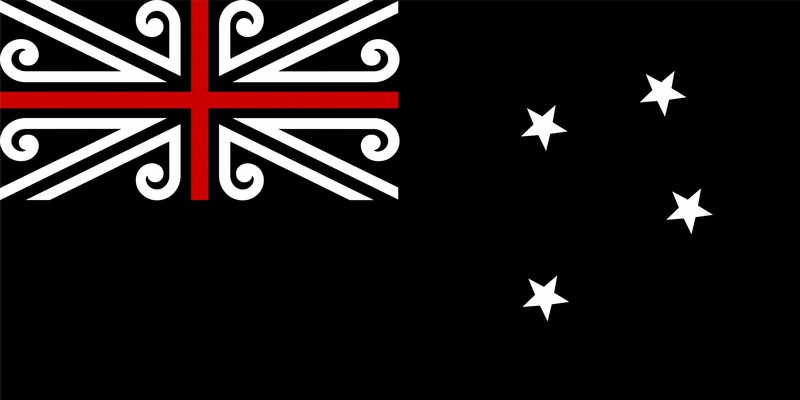 In an open letter to the peoples of New Zealand, the panel for the Flag Consideration Project introduced 40 finalist designs for an all-new flag. Voters will decide what happens next in two referendums: one in November–December, and another in March 2016. For my upcoming trip to London I have once again planned a trip to West Sussex. I last visited six years ago this week, and walked along the River Arun and through the village of Amberley before refreshing at The Bridge Inn and heading back to London. For just £13 I've booked a train not to Amberley, but one stop further, to Arundel, on my birthday. The plan is to walk through the village, past Arundel Castle, and then on various footpaths up the River Arun to Amberley and, yes, the Bridge Inn. Wow, I hope it doesn't rain. This is all part of a plan to catch up on reading, you see. And to catch up on cheese and onions crisps, which are hard to find in the U.S. Problem: my keyboard suddenly wouldn't respond to the left-shift, enter, 3 or F5 keys. No idea why this is. Tested with mskey.exe, tested on another machine...still those four keys aren't working. Solution: Get a new keyboard. Walk 10 minutes to Staples, find the same make and model, buy it, return to office. New problem: New keyboard's spacebar is broken. 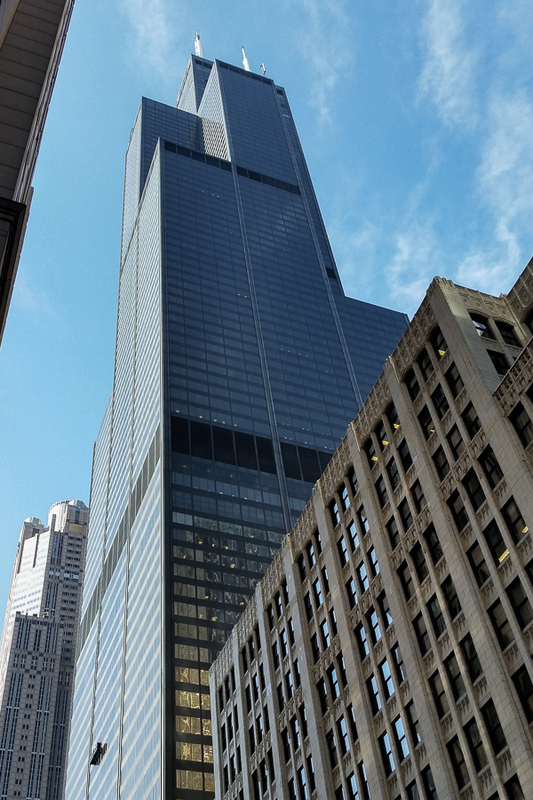 When I say "rinse and repeat" I mean that when heading back from Staples—this is the Chicago Loop, so one walks everywhere—it started to rain. Which is good, because the dewpoint is about infinity. Now I'm cranky, damp, hot, and tired (which was a pre-existing condition today), and unproductive. Illinois experienced its wettest May – July on record with 500 mm of precipitation, 200 mm above the 20th century average, according to the National Centers for Environmental Information. Most of that was due to the record precipitation of June with 240 mm statewide, based on their latest numbers and discussed in more detail here. That is about an extra two months of precipitation during that three-month period. Factors include the Ridiculously Resilient Ridge out west and possibly the incipient El Niño taking hold in the Eastern Pacific. 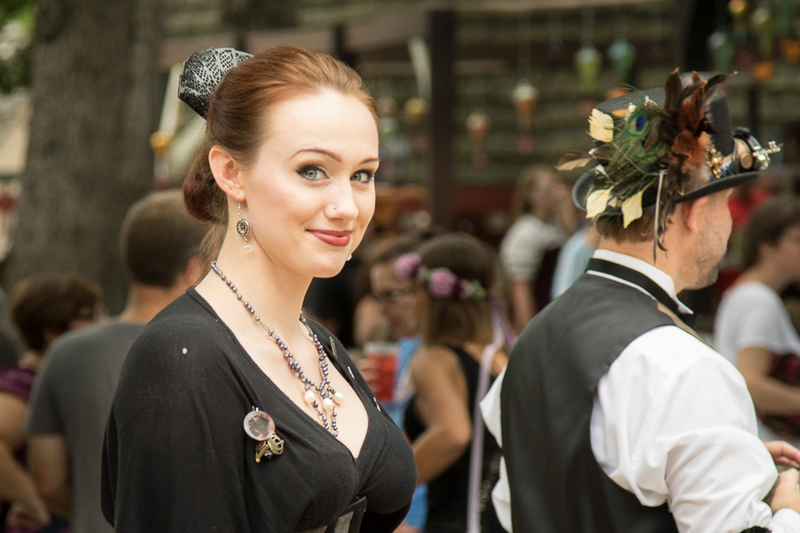 After not going to a Renaissance Faire in so long I don't even remember my last visit, it was fun going three times this summer, each with a different group of people. 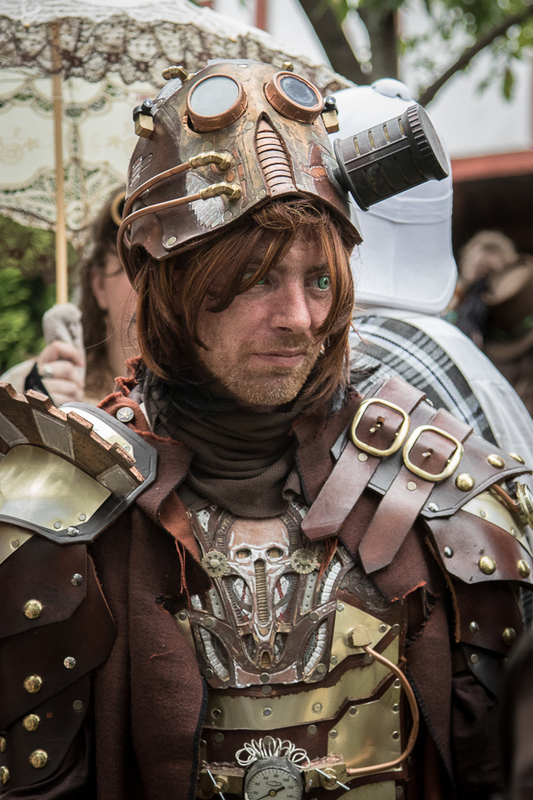 Yesterday was Steampunk Invasion, which attracted crowds one of the more regular Faire attendees in our group called "epic."